Send a warm thank you and contribute to holiday festivities with our Giving Thanks Basket. 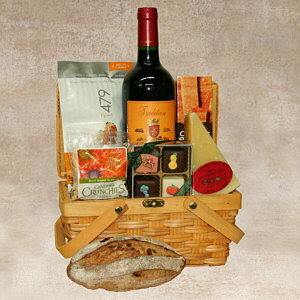 We chose Chateau Fitere Madiran for this basket, from the Southwest of France should go great with holiday fare. You can instead choose a Riesling that will also complement any Thanksgiving fare. Along with this we have tasty artisan treats including Ginger Sesame Caramel Popcorn, Fresh Fig bread, Sonoma Vella Aged Jack Cheese, Autumn themed Petits Fours, California Crunchies Almonds, and our mouth watering Cookie Brittle. Send Thanks and receive them in return.